One of Oberlin’s proudest legacies is the town’s role in the Underground Railroad and the fight against slavery. That so many of its citizens were ardent abolitionists is not unknown. A number of people acted in national, state and local theaters to assist people seeking freedom. Naturally, these people’s abolitionist sentiment explained their actions. For one Oberlin man, Hiram Alonzo Pease, history has not shown an exception. 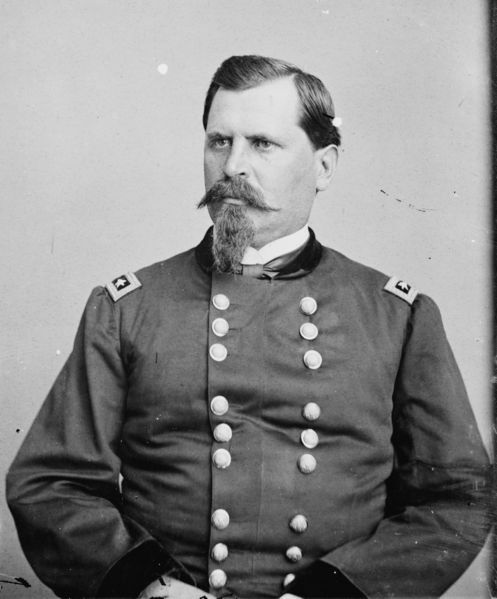 As a Captain of the 41st Ohio Volunteer Infantry during the Civil War, Pease’s resignation from his post has long been seen as a protest against the decision of his commander, Colonel William B. Hazen, to return two runaway slaves to their southern master. The narrative of Pease’s resignation as an instance of Oberlinian refusal to be complicit in slavery most likely stems from Robert Fletcher’s 1943 book, A History of Oberlin College, in which the author briefly mentions the incident: “Pease resigned because the colonel insisted on returning escaped slaves to their masters”.1 However, the real reasons for Pease’s resignation, and the events surrounding it, suggest his story does not fit so nicely into the accepted historical narrative. For his own part, Hazen did little to defend himself in the press, except for an affidavit that was published in the Cleveland Morning Leader. In his memoirs written after the war, Hazen did not mention fugitive slaves. He did not even mention Pease by name but wrote that “individual exceptions must be made; but most of the officers proved themselves competent.” Hazen also noted, “Officers not suited to their places, either from want of industry, character, or other causes, soon made their unfitness evident in many ways; and when there was no hope, they either voluntarily resigned or were informed in a kind way that they were not likely to be useful, and quietly went home.”23 By all accounts, Hazen was a tough disciplinarian, but a fair and even kind officer. Pease, on the other hand, did not appear to have the qualities needed to be a Captain in the service of the United States Army. He admitted as much in his initial explanation in saying that he sought to treat his men as equals despite army regulations against fraternization. The long standing reason for Pease’s resignation, in the fugitive slaves, seems to have come from the initial reports of the story itself. Editors wrote of the need to inform their readers in abolitionist northeast Ohio the truth of the story. Because of the abolitionist sentiment of so many people in Oberlin, Hiram Alonzo Pease went down in Oberlin history as a man who resigned his commission based on his anti-slavery principles. 1Robert Samuel Fletcher, A History of Oberlin College: From Its Foundation Through the Civil War, Volume II. (Oberlin College: Oberlin, Ohio, 1943) 867. 2Rev. Delavan L. Leonard, D.D., The Story of Oberlin: The Institution, The Community, The Idea, The Movement. (Boston: The Pilgrim Press, 1898) 433. 3Hiram Abif Pease, Subject File/People, P, Pease Folder, Oberlin Heritage Center. 5Mary Jane Haverstock, Jeanetter Mahoney Vance and Brian L. Meggitt eds. Artists in Ohio, 1787-1900: A Biographical Dictionary. (Kent State University Press: Kent, OH, 2000) 668, and Oberlin College Alumni Directory, 1908, (Oberlin College: Oberlin, OH, 1908) 750. 7Cleveland Morning Dealer, October 6, 1861. 8Robert L. Kimberly and Ephraim S. Holloway, The Forty-First Ohio Veteran Volunteer Infantry in the War of the Rebellion 1861-1861. (W.R. Smellie: Cleveland, OH, 1897), 227, and Cleveland Morning Dealer, October 6, 1861. 9James McCreary to "My Dear Friends", November 13, 1861. Oberlin College Archives, Record Group 21, Series: 2, Subgroup: B, Box# 1 James McCleary 41st OVI. 11James McPherson, Battle Cry of Freedome: The Civil War Era. (Oxford University Press: New York, 1988), 352-353. 13Lorain County News, January 22, 1862. 15Lorain County News, January 22, 1862. 16Cleveland Morning Leader, February 4, 1862. 17Cleveland Morning Leader, February 12, 1862. 18Lorain County News, February 12, 1862. 19Cleveland Morning Leader, February 12, 1862. 20Cleveland Morning Leader, January 30, 1862. 21Glenn Longacre, editor, To Battle For God and the Right: The Civil War Letterbooks of Emerson Opdycke. (University of Illinois: Champaign, 2007), 12. 22Lorain County News, March 12, 1862. 23General W.B. Hazen, A Narrative of Military Service, (Ticknor and Company: Boston, 1885), 8-9.